I have had the plant for about a month now and it is still alive! Really nice moss, came back to life with lots of water. But, the moss had TONS of pine needles in it that needed to be cleaned out, which was really annoying. Wish the moss had been not been so sloppily packaged. Shipping was very fast and i love my moss, it make my yard look so much better! The cushion moss sent to me was some of the thickest moss I've ever seen, certainly robust and healthy and varying shades of green. It has been less than a week, but with watering everything has stayed plush and green. I also ordered other mosses and the patchwork look gives the loss garden dimension. Cushion Moss is an easy grower. Cushion moss is a large moss that forms balls of mossy green. This moss can be used inside in terrariums and aquariums as well as outside. Cushion moss needs shaded areas to grow and moist soils. This moss will spread over its surroundings as long as they have the required shade and moisture to live in. Cushion Moss also loves acidic and clay soils to grow on. Cushion Moss is one of the most commonly grown mosses because of it being so easy to grow and needing little maintenance. Cushion Moss can sometimes grow onto wood and rock as long as its moist enough for the moss. Cushion Moss, also referred to as White Cushion Moss is a commonly used moss that forms what looks to be like a thick cushion. The colors can vary from light gray and sometimes even blue-green coloration. In the scientific community, it is called Leucobryum Glaucum. It is a small grower at 3 inches tall depending on climate and other various conditions. Oddly enough, this type of moss will grow in a ball shape, but some kinds will form a mat across your garden area that grows up to three feet. This moss is most commonly found in areas such as moist woodlands and marshes because it requires much shade and water to survive and reach its potential. You will see this growing in just plain soils, rock ledges, bases of dead or living tree trunks as well as logs. Like all other species and kinds of mosses, the Moss does not have roots and will not produce any flowers or blooms. They merely stem with many tiny leaves growing on them. The leaves are small, only reaching a few millimeters in length. How does this plant receive nutrients and water? The moss will merely absorb water and other nutrients through its many leaves, like a sponge absorbing water. Additionally, the moss will sprout tiny stalks that are called sporophytes to reproduce. When the stalks are tall enough, the ends will open up, and the spores will fall out. These are the same as seeds on other plants and will travel by the wind to start the new growth of itself in another area. It is indeed nature at its core. This moss, like most others, also helps to provide the type of shelter for many small animals, as well as insects. Many birds will even use the moss to help build and line their nests during the spring when they begin to build them. Some animals such as the water bear and snow flea will use this type of moss as a source of food and nourishment. Some different kinds of animals that will find shelter in this moss are salamanders, centipedes, water bears and newts. It filters the air, and cleans rainfall water and will add a tranquil feeling to any garden or landscape area. Moss needs two primary requirements to ensure its survival and proper growth and development. Shade is the first requirement as no species of moss can tolerate an area with full sunlight. The most they will be able to withstand is a little morning or afternoon sun during the day; So when deciding where to plant this moss in a particularly shady area. It is great because it will grow and thrive where other plants and flowers have failed you in the past. The next thing all moss will require is moisture and watering. When planting, the soil will need to be very moist to help the plant become established. It can take two to four months to make sure the plant is watered quite often to ensure its survival in your garden. Once the moss grows in your garden, it will become somewhat drought tolerant as far as soil conditions are concerned. However, the moss will still need to be misted from time to time. Since moss has no root systems, they will absorb the water and nutrients through their leaves as well as receive these same things from the air. Moss can grow in a variety of different soils until they are established, so this is not a concern. Growing it in plenty of shade will allow for tremendous growth. If you want to make your oil soil mixture for your moss, a great combination is a manure, topsoil, and sand added to your soil where you plant to put the moss. When you have decided on a shaded area for your cushion moss plant, you will want to remove weeds, leaves and other obstacles and then break the soil apart so that it is loosened before planting. Add water to any other fertilizers or other plant helping items to the soil. After these steps have been completed, just add your cushion moss plant and watch it flourish! If you want to relocate your moss, it is relatively easy and straightforward to move clumps or even entire sheets of it from one place to another. Again, just make sure the spot you are relocating the moss to is very shady and yet you will want to keep this plant thoroughly watered until it is established in its new home. This moss is quite the beauty to add to your garden. 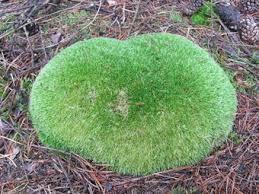 The cushion moss grows in a round ball which looks similar to a cushion because of the way it is bushy and can grow quite large. This moss is commonly found growing under trees, in valleys, along walkways or around rocks. This moss can cover a large area in a small amount of time. It prefers shade but can grow quite well in the partial sun too. As the sun hits the cushion moss, it has a silvery white tint to it. 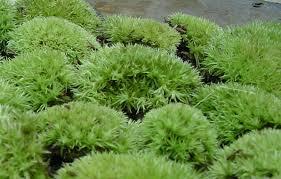 Cushion moss that is native to North America and this moss will grow in dense clumps and will have beautiful foliage. Although it will not produce blooms or flowers, it will still add color and life to your garden especially in shady areas where other flowers and plants will just not grow at all. The white cushion moss almost looks like a giant pincushion when it spreads out and it just breathtaking and a beautiful display of greenery added to a garden or landscape. A beginner or a seasoned veteran, cushion moss is a great way to go. It is easy to grow, and it will also give your garden the pop of life and newness it may need. Add this moss to your garden and shake things up. This moss can add beauty and color to any place that it grows. Do you have a flat area in your yard where nothing seems to grow? Plant this moss and watch it take flight! Cushion Moss goes by several different names; the white moss is the most common. This plant is used for decorative purposes as well as can be used in terrariums, aquariums or grown indoors. This moss is an easy grower and requires no maintenance. The way this plant grows gives it its name because it grows in clumps and they look like cushions. This moss is white when dry but will turn a dark green when it is wet. This moss will spread along the ground when it is grown. Cushion moss gets its name because how it is soft, flat and thick like a cushion.